Wood burning stoves and an abundance of different shades of white dominate the Scandinavian homes together with graphic lines, natural wood and a touch of colour every now and then. Whether you’re following interior designers on Instagram or browsing through a lifestyle magazine, it’s not hard to recognise the unique Scandinavian style. A wood burning stove often has a central place in the Scandinavian home so that’s the first step to Scandinavianise your home. Here, we have gathered 10 tips that will give your home that Nordic feeling. Nordic style has been popular since the 1950s. The look is clean, simple and stylish and has been influenced by the light summer evenings that last long into the night and the equally long winter nights where you gather in front of the wood burning stove’s crackling fire. Get a wood burning stove – for many Scandinavians, the wood burning stove is the centre of the home and it is used both to keep people warm and to create a cosy atmosphere on those cold winter days. 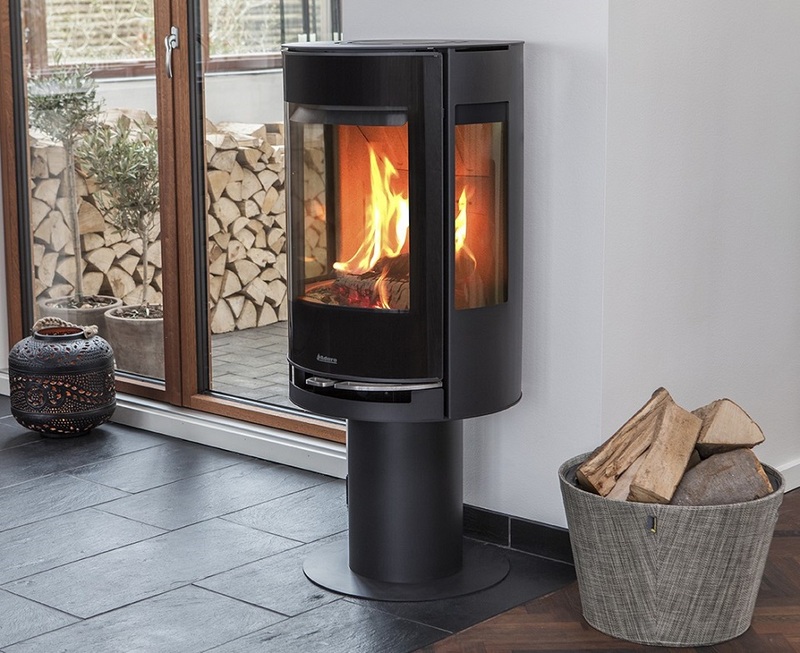 Read more about choosing a wood burning stove here. The second step is to paint your walls white – walls of any other colour are a rarity in Scandinavia. Scandinavians have a long dark winter to go through and are very appreciative of light. Install big windows. Big windows let in the light and can change a room drastically with the openness they bring to it. Scandinavians are all about simple living – try to avoid clutter and have only a few well-chosen accessories – for example the Kay Bojesen monkey and some Lyngby vases. Natural wood is a key ingredient in the Scandinavian living room. Do not even think of getting a wall-to-wall carpet. The floor must be of natural wood and the same goes for most furniture. Some pieces of wood in a wood basket standing next to the stove will also further emphasise the Scandinavian look – Scandinavians love nature and love to bring it inside the home. Lamps and tea light candles. Every little source of light is appreciated and nothing helps along that particular Scandinavian feeling of ‘hygge’ like candle lights in a dimly lit room where the only other source of light is the fire in the wood burning stove. There’s nothing like an Icelandic blanket or sweater to keep you warm in those cold winter afternoons when you’re home after a long day’s work. Wrap yourself up in the Icelandic wool that’s both comfortable and decorative. Scandinavians are all about clean lines, and graphic posters are a good way to add some colour into those black and white homes. Furniture – since the 1950’s Scandinavia has been famous for its furniture design. Try checking out the Wegner chair or Arne Jacobsen’s Ægget – but beware, these are popular so they are far from cheap. Colours – although white is the colour of choice, there is always room for both subtle and bright colours when it comes to accessories. Check out Finnish Marimekko which is famous for their bright colours and bold patterns.